Why Do These 4 Myths About Homelessness Persist? This time of year, many California counties are conducting point-in-time counts to figure out who is homeless and why. The U.S. Department of Housing and Urban Development requires these counts from any community that wants federal funding for housing and other services for the homeless. But if governments and service providers have developed a more data-based understanding of who's living in shelters, vehicles and on the streets, the rest of us often operate off our gut instincts. Are you willing to check yourself? Experts say this is one of the most common misconceptions about homelessness, and it is often paired with another idea, explained Mark Shotwell, executive director of the Ritter Center in Marin County. 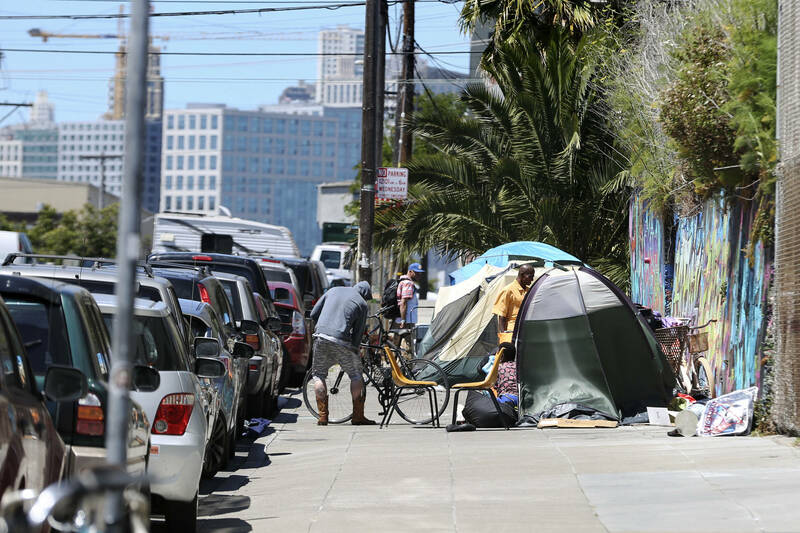 "I've worked in four Bay Area counties, and in all of the counties that I've worked in, the belief is that if you create certain kinds of services, it will attract people who are homeless to come from other communities," Shotwell said. Generally, no. Shotwell directs your attention to the last point-in-time survey in Marin County in 2017, which he said is not substantially different from the survey two years before. Shotwell said "a series of unfortunate events" explained each neighbor's story, though the particulars vary: a lost job, mental or physical disability, addiction, divorce, domestic violence, eviction, etc. The rising cost of housing plays a key role, too. "Losing one paycheck, losing one job, really could result in instability." Tempted to insist Marin County is an outlier? 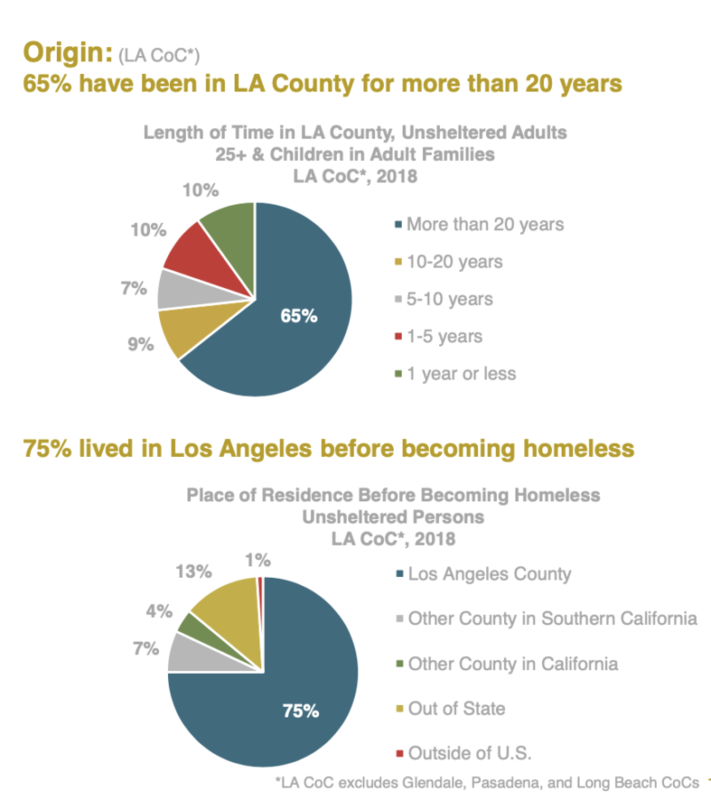 Let's look at a couple more California counties that top the lists in any discussion of homelessness in California. Of the roughly 30 percent of homeless people surveyed in San Francisco two years ago, the bulk of those not from San Francisco were from California. That may not technically be anybody's idea of a "neighbor," but it does suggest a recalibration is in order for those of harboring suspicions "they" came "here" from far away. One or two personal conversations with individuals who insist on the freedom of the streets does not necessarily give you an accurate picture of how most homeless people feel. For one thing, social service providers say, the isolation and physical hardships of homelessness can prompt many people to find ways to justify their suffering or at least resign themselves to it, for sheer psychological survival (see Myth #3 for more on that). For another thing, living on the streets brings with it logistical complications that make it hard to imagine getting off the streets. Summer-Lee Bettencourt used to be homeless herself before social service workers helped her get back on her feet. She was sold to human traffickers as a teenager, and while she eventually managed to escape, she needed help building a new life for herself. 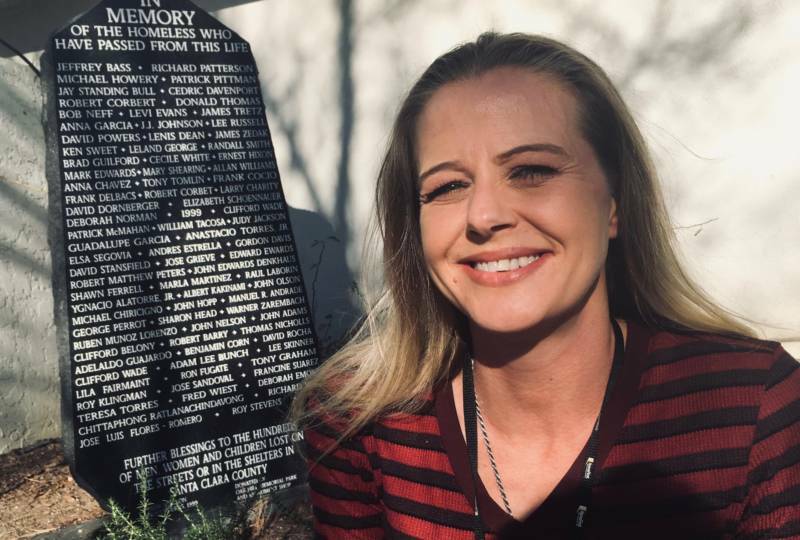 She works now for Supportive Services for Veteran Families in Santa Clara County, and explained that the longer you are homeless, the harder it is to conceptualize what steps are necessary to build, or rebuild, a life in housing. "A lot of people, they don’t know where to go. They don’t know what to do. And they need help being connected to housing first. I mean, how can you go on an interview if you can’t take a shower? If you don’t have clothing? So they feel lost. They just need a lot of support, compassion, understanding," Lee Bettencourt said. Dr. Jeffrey Seal is the medical director for Alameda County Healthcare for the Homeless, and he's also a psychiatrist who helps manage the Trust Clinic in Alameda County. "Every morning, we have a line of patients waiting to be seen here, and you can imagine: schizophrenia, bipolar — and one that commonly gets left out when we’re talking about homeless populations is the trauma related disorders," Dr. Seal said. "You know, a lot of people who have suffered a significant amount of trauma since early childhood end up out there. If you could possibly think of the environment that would make their symptoms worse, this would be it. Right? Put somebody into a park. Make the situation unpredictable. Put them at risk of violence." He added, "Psychiatric medications were tested on people who have stable environments, they’re housed, they’re middle class people who were put into randomized, controlled trials. So [medications] can certainly be helpful, but it’s really a joke to say that psychiatric medications would lift someone out of homelessness." He's not arguing against medications, but seeing them as a solution outside the context of other supportive services. Think you've got nothing to offer other than your spare change? Think again, said Donna Colombo, executive director of the Trinity Center in Contra Costa County. "Come talk to me. All homeless service organizations need volunteers to help do a lot of things. All you need to do is show up," Colombo said. Horace Crawford has been showing up for about ten years now. The 81-year-old retired architectural engineer said many people get overwhelmed by the "big picture" and fail to see how they can deliver practical help in all sorts of ways. 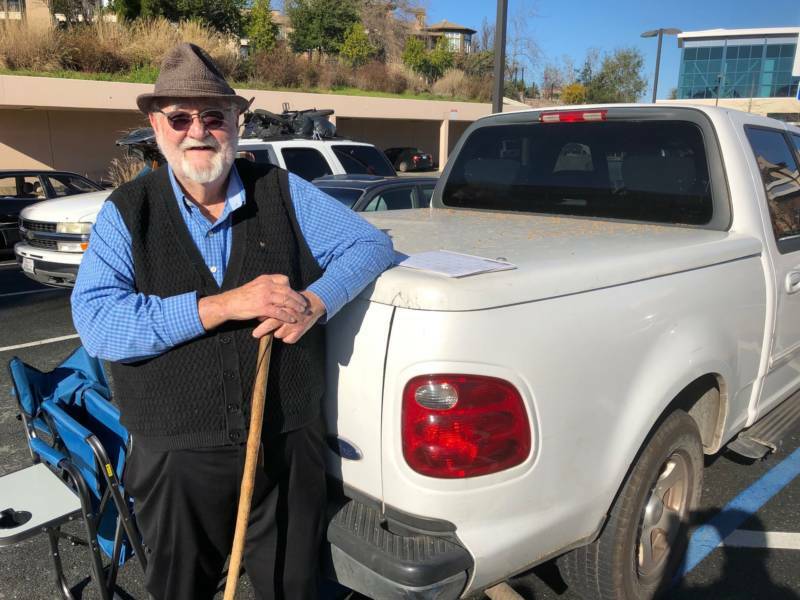 For the past few years, Crawford has made himself personally available to homeless individuals in the area, using his truck to help move people’s belongings or drive someone to a medical appointment. He’s also taken it upon himself to coordinate day work for homeless people, building a local network between them and those who want to help. He recognizes there can be an intimidation factor to working so closely with homeless people. "People are a bit afraid of working with a homeless person, but if they know me, and I vouch for someone, they’re OK. Result is, I’ve got a bunch of friends that I’ve never had before!" he said.